Tip #221: What do you do again? This is Suzie from UltraCorp. The problem with this email, other than the fact that it’s sad and desperate, is this: I don’t know what went wrong, because I forgot what the product is and what it does. You’re assuming that I know something I don’t. And you just lost an opportunity to re-sell me on it. Now, I’m sure there was a good reason I downloaded or signed up for it in the first place. I was probably excited to use it. Maybe it did just what I needed. But then the need diminished, and I forgot about it. That happens. So what’s the best way to handle that? By reminding me of the product name? Of course not. You need to remind me what WhateverApp did for me, or how it made me feel. Anything else is a massive failure. Hey Rafe, I’ve noticed that you haven’t used MomApp lately. According to our logs, you signed up for MomApp, the #1 app for reminding you to call your mom, on January 15 this year, and used it six times. * Keeping you up to speed on what you mom’s friends are posting on Facebook. If you still need to do these things, try MomApp again! We even just added a new feature: Now we’ll remind you to call Dad, too! If the app let you down in any way, we’d like to know why. Our engineers are always improving MomApp! Reply to this email and let us know. We’d love to see you on MomApp again. So would your mom. In other words, don’t look at user fall-off as a failure. Look at it as a way to delight the customer with your pitch all over again. Tip #220: What is it? This ad appeared in my Facebook stream. But what is the HP Elite Slice? A Wifi router? A USB hub? A computer? A doorstop? Oh, this is great: PR firm Publicize has a page of “Principles When Contacting The Media.” Very nice. Hope the company can actually live up to them. Do have an internal code of conduct for yourself or your firm? Is it public? I think it’s a good idea. 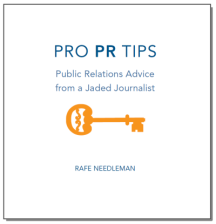 Especially since most of these principles are already Pro PR Tips! If your business is all about keeping promises — say something like insurance, or perhaps Web site hosting — you really want to make sure that when the chips are down, you can actually make good on those promises. This comes up because today I visited Luke Rehmann’s password-checking site, from a link in a BGR story we ran about a big password hack. Rehmann’s site is getting hammered as I write this (my analytics show that the story about the hack is one of the biggest we’ve run in months) and it has buckled under the load. Now, to be fair, CloudFlare does not actually claim to be running Rehmann’s entire site. The CloudFlare service caches the Web front-end to the site, but the database that the site hits is, likely, not part of the system. So the site can give you the cached version of the site, but it can’t do anything about the database, which appears to be swamped. That’s not CloudFlare’s fault. But the messaging is all wrong. CloudFlare’s banner at the top of the site seems to say, “Use CloudFlare and your site will never go down,” when, in fact, CloudFlare can’t make that promise — because it’s not designed to do what’s necessary to keep a database site online. If the whole point of your product, as spelled out in its brand, is to do a thing, then your product should do that thing. If it doesn’t, sending out self-contradictory messages will just confuse people, and probably annoy the crap out of your customers. At TechCrunch Disrupt, during a quick stand-up meeting with one of the “demo pit” companies, the startup CEO I was talking with tried to stick a big logo sticker onto the page of the notebook I was writing in. As you can imagine, I didn’t take kindly to this action. But after a moment of reflection, it came to me: Notepad stickers are a great idea. If you do them right. Just remember to not try to put the sticker on their notes for them. Eww. If you do this, let me know how it goes over. Pro PR Tip #103: Agency, Shmagency. Reminder: Since January, I’ve been the editor of Yahoo Tech. We cover consumer technology. Pitch me. Understanding jargon is a big part of covering technology. But no one reporter knows all the buzzwords. So saying that “everyone is talking about” acronyms you can be sure that most people have never heard before (except the geeks in your particular industry subset) is a waste of an opportunity to connect. Everyone is talking about SDN and NFV. But at Mobile World Congress 2014, [[company]] will go beyond the buzzwords and conduct the first public live demo of its Distributed NFV (D-NFV) solution. On the other hand, you don’t want to talk down to people, either. Because then I’ll do another Pro PR Tip that’s the exact opposite of this one. So you can’t win. Unless you know who you’re pitching. This one started with one ill-advised tweet and spiraled in from there. Thank you, Ziklag Systems! The tweet that launched a thousand Pro PR tips. Each of the following crimes against the media could be its own Pro PR Tip. Many already are. It’s also true that some of these flops are more important than others. But since this one tweet led to so many great PR lessons, I thought a list here would be educational. Contact via Twitter. Unnecessary and annoying. (I also got an email). From a new account whose only purpose, so far, has been to send the same spam tweet to journalists. Say What Systems? This company is new to me, and it’d be nice to know what it does. The tweet didn’t help. That’s too bad. It could have.